Originally from Northern Ireland, Daniel Martin came to America to fulfill a dream. After a nudge in the right direction, Built By Martin was born. Daniel Martin has a lifetime worth of experience with woodworking, dating back to his childhood. While most kids are watching tv or playing games, Daniel was working on wood with his grandfather. As he grew older, his hobby turned into a passion. Daniel has always had a side business being a craftsman, but it wasn’t until he moved to Nashville that he realized it was his purpose. “ It was Christmas Eve six years ago, and my boss asked me to build him something cool.” Too excited to go home, Daniel went straight to the store to begin work. “On my way to get supplies I saw a guitar, and knew exactly what I was going to build.” A few days later Daniel came back to his boss with a guitar table. The success of this project pushed Daniel to turn his hobby into a full-time job, and so Built By Martin was born. Built By Martin is a product of passion and determination. Daniel and his friend Mike Hale provide some of the finest woodwork around. To learn more about their company, read below. Built by Martin can tailor to your every woodworking need. 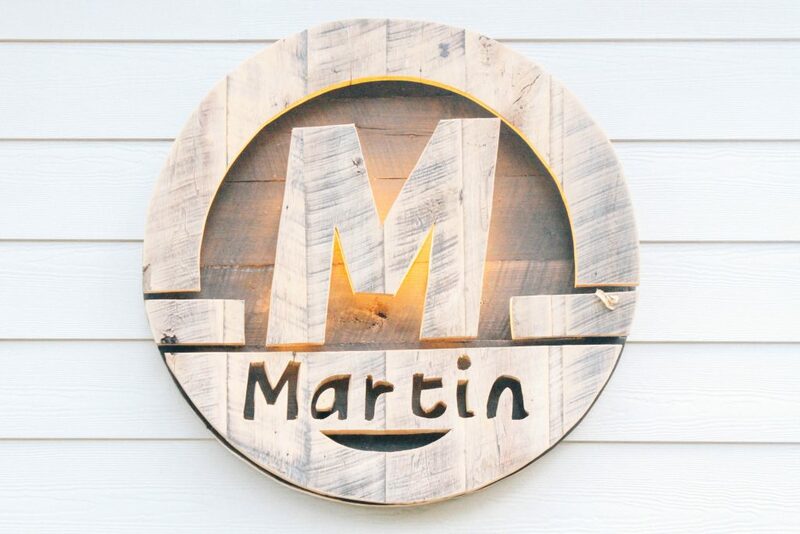 Whether it’s cabinetry, flooring, builtins, patios, tables, beds, or guitar tables-Built By Martin can create it. Timeline – Depends on the design and size. Custom pieces take 4-6 weeks, and guitar tables take 6-8 weeks. All project timelines are relative to the amount of orders placed. However, if you need a piece done in a shorter time frame, Daniel and his team will make it happen. Future Plans – In the future, Daniel wants to have his own storefront on 8th ave. He plans to do this within the next two years. The thought of being able to sit with his dog all day and work on what he loves is enough motivation for him to make it happen. Built By Martin works with a lot of local favorites: The Hook, Sinema, Tin Cup, Bobby Bones Show, and The Nashville Predators. Currently, Daniel is working on a bar concept with John Rich from Big and Rich to be built in Las Vegas in the next year. Daniel Martin has a passion for serving others. “The more I give back to people, the happier I will be.” he says. Currently, 20% of all profits are donated to St. Jude Hospital in Memphis. Daniel is also working The Bobby Bones Show to raise money for charity. He built a table that has been signed by multiple artists including: Taylor Swift, George Strait, Zac Brown, Band Perry, Blake Shelton, and Ed Sheeran. The table will be auctioned off at the end of this year with all proceeds going to charity. When Daniel visited Nashville in 2005 he fell in love with music. “I came back to Ireland wearing a suit, cowboy hat, and holding country cd’s. My friends made fun of me a lot.” Daniel didn’t let his friends bother him though, he kept listening to the music. “I used to drive in my truck blasting the country cd’s I brought back. The more I listened to the music the more I saw the meaning.” The passion and patriotism of the songs created a connection, and now Daniel can’t go a day without music.